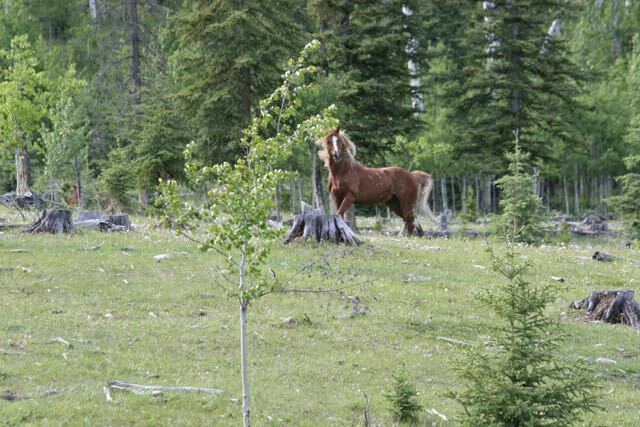 We spend a considerable amount of time travelling throughout wild horse country to document, observe and photograph the Alberta wild horses. Just to see them on any given day, after all these years, still brings joy to our hearts. 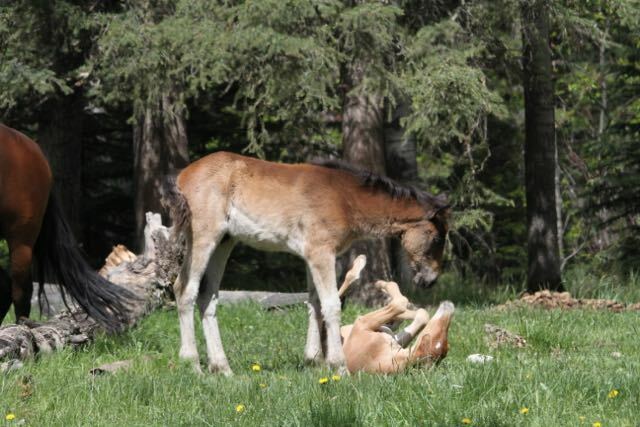 Every once in a while though, we get to witness horse behaviour that makes us laugh and smile. 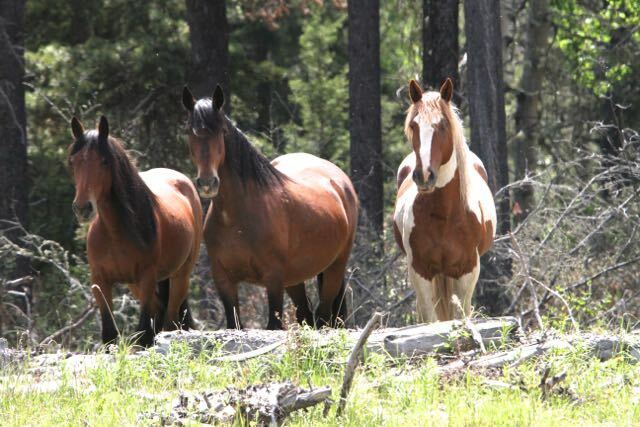 One day we came across a beautiful herd with three healthy foals hanging around a mineral lick. 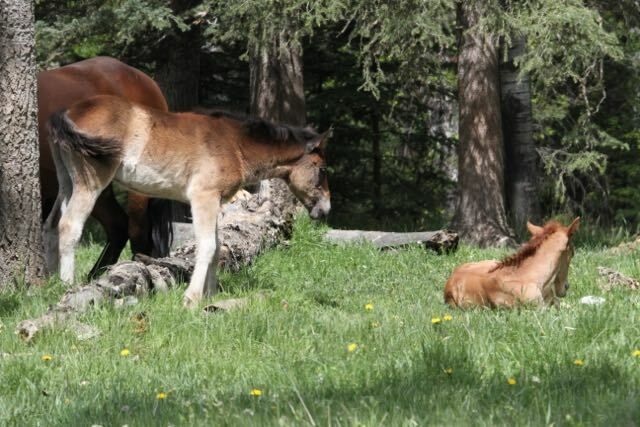 As we watched and photographed, one of the younger foals decided to take a break and lay down. His herd mate decided he wanted to play. It was amusing to watch him go and start bugging his friend. We laughed as what appeared to us the little one objecting to the interruption in his nap time! The pestering continued until he had to get up. Okay. . . I’m up already! 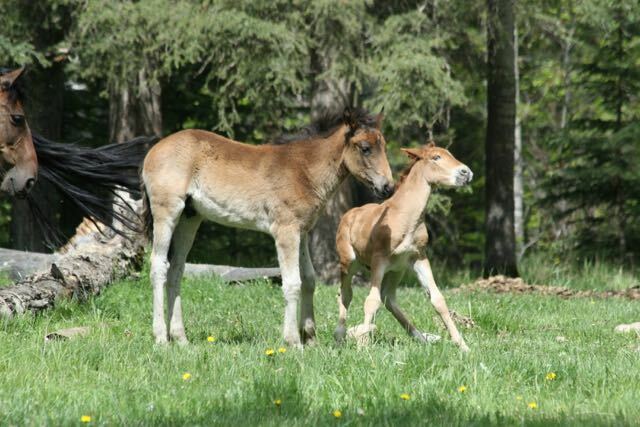 Once the older foal had his way he left his buddy alone and went over and had a drink from mom. 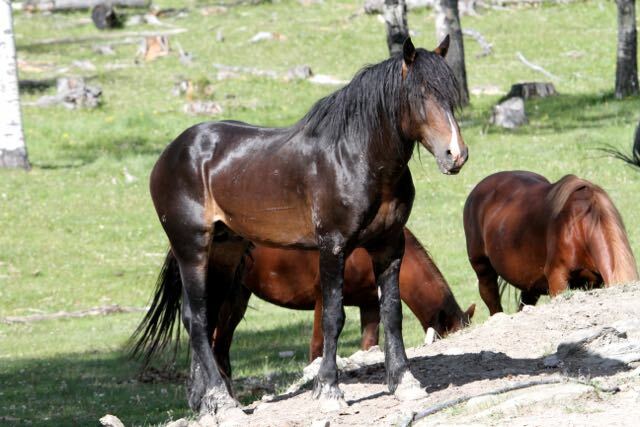 On another day we came across a family herd where the mature stallion was allowing a younger stud to hang in close to his herd. What happened next was one of those things about horses that made us laugh. 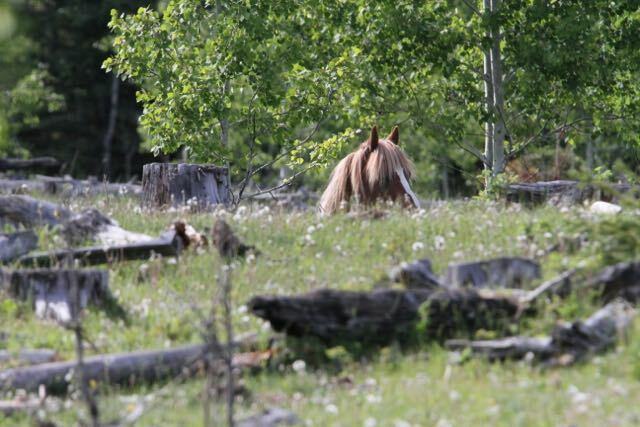 Another young stud with flaxen mane and tail came out of the trees a little ways away from the tranquil setting that we were watching. He seemed to be checking out whether he could join in. 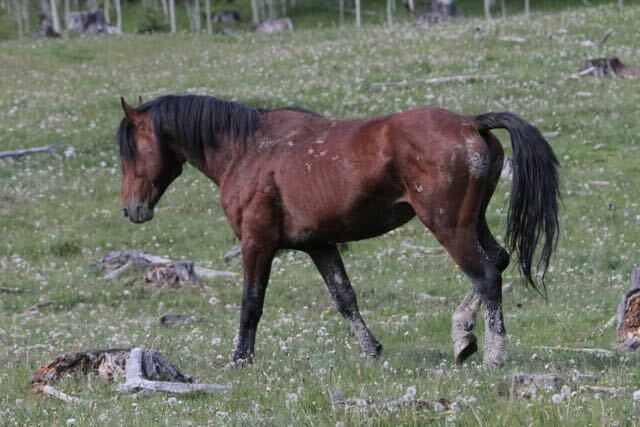 As he walked further into the meadow we could see that he had many skirmishes already this spring as his body was full of scars from bites and kicks. As he stood there he seemed to be analyzing the situation – should I go or should I leave? As soon as he made his intentions clear that he was going to come into where the herd and another young boy were, things began to happen. As he came closer the other young stud decided to go out and confront the intruder. 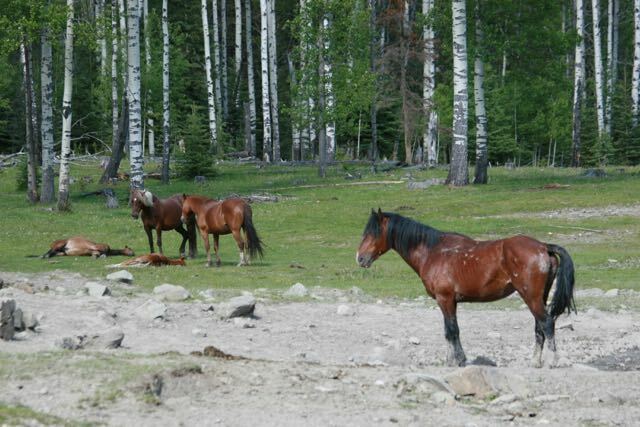 The whole time the herd stallion stayed in the shade of the trees and just watched. As you can see these two had met before – more bites and kick marks apparent. 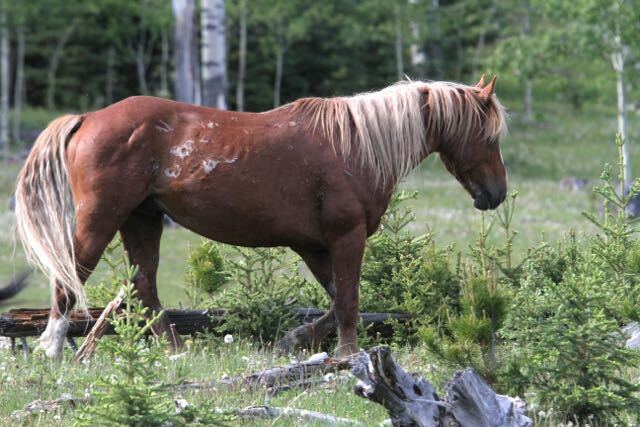 All of a sudden as the bay coloured stud got close he shifted it into high gear and took off after the flaxen boy. 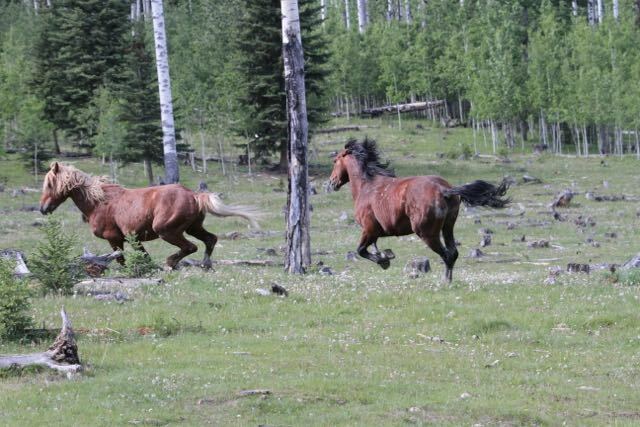 Wheeling around off the two went kicking and bucking. With ears pinned back, the bay boy meant business. 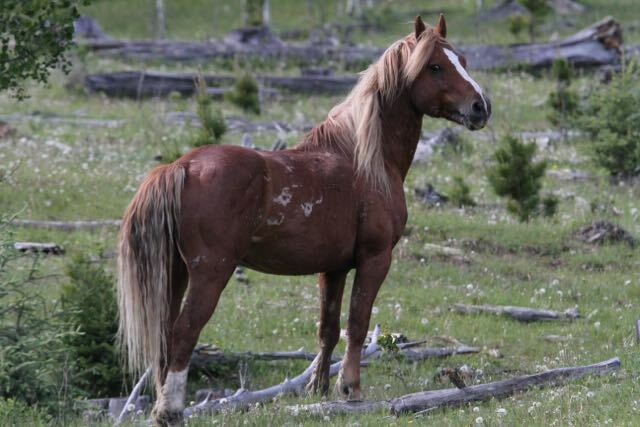 As in all incidences of young studs and stallions confronting each other, no lasting harm was to occur. Meanwhile the other young fellow was left to wander off again until it was time for the next challenge. 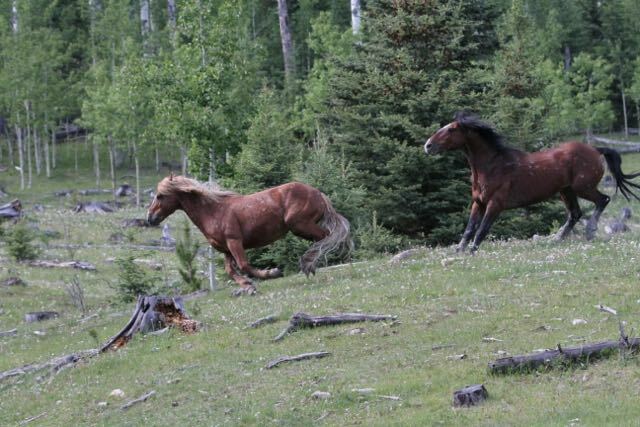 Such is the life of young wild horse studs! 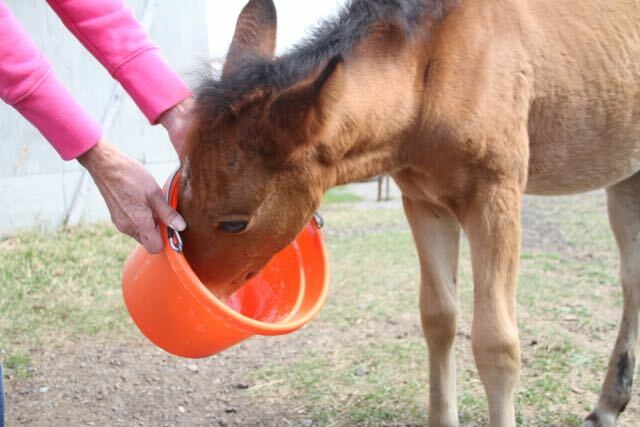 We also thought we would update you on the young foal that was rescued a few weeks ago by WHOAS members. 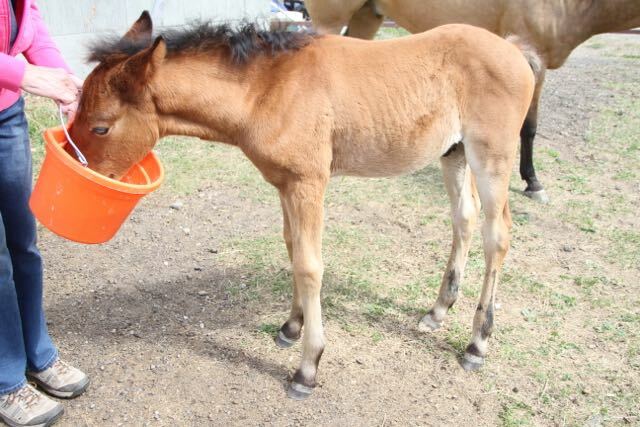 Young “Coulter”, about a month old now, is living with two older geldings who have adopted him. 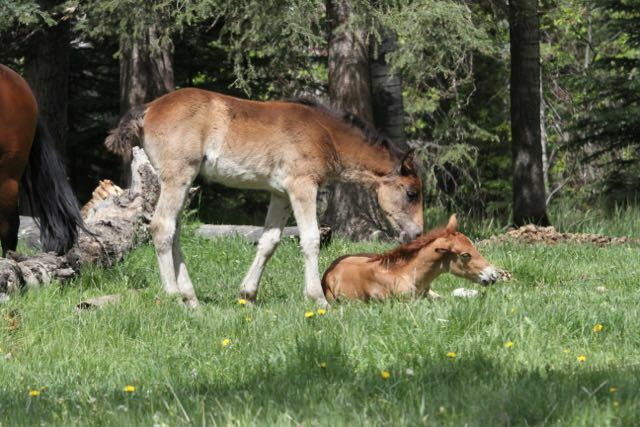 They nurture him with some affection and also make sure he learns proper horse behaviour. 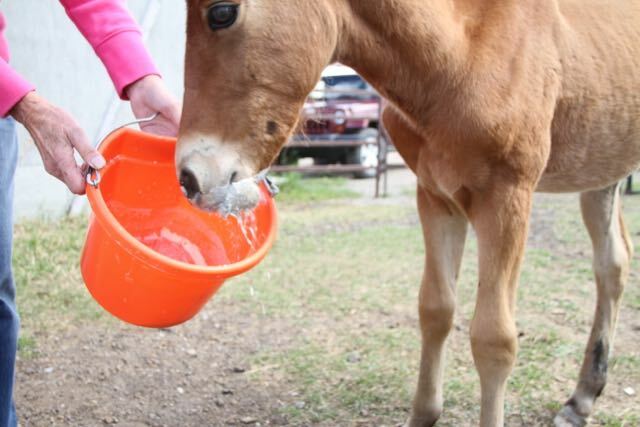 He enjoys his warm, foal replacement milk several times a day and is thriving and growing every day.